5 Beds 4 Baths 3,890 Sq. ft. 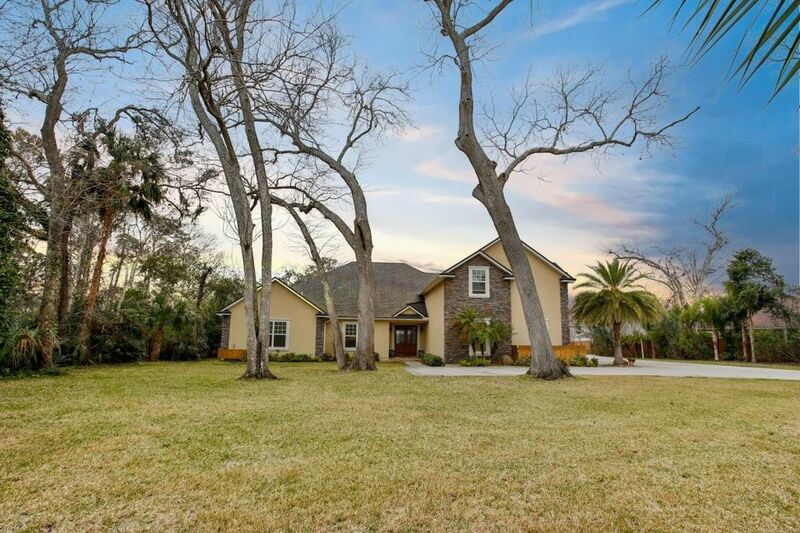 Extraordinary home located on estate-sized 3 acre parcel backing to marsh & Intracoastal. Builders own custom home w/ stunning appointments throughout. Lavish 1st floor master & 3 other BR's down. Upstairs bonus room, BR & BA. Kitchen w/ large island, gas range opens to great room w/ 20' cathedral ceiling w/ exposed beam, floor to ceiling stack stone gas fireplace 2 sets of atrium doors w/ integral blinds leading to outdoor paradise that features a covered lanai, free-form pool w/ flagstone patios & stack stone surround, tiki style summer kitchen w/ wraparound bar w/ cabinets, gas grill, refrigerator, sink & beer tap, 4 wheel drive sport track & 2,000 sq ft building w/ high ceilings & garage doors perfect for boats, RV plus private car storage area w/ AC. Truly you own private retreat.